The ‘Nakwaxda’xw moved about around their territory seasonally: fishing, hunting, and gathering various materials, but between 1884 and 1964 one of their main villages was at Ba’as (also written as Paas or Pahas), at Blunden Harbour. The name Blunden Harbour was bestowed by Captain Pender of the Beaver in 1863, after Edward Raynor Blunden, who was an assistant on the Hecate (1861) and the Beaver (1863) which surveyed the area. Long before the area was surveyed it was home to the ‘Nakwaxda’xw. 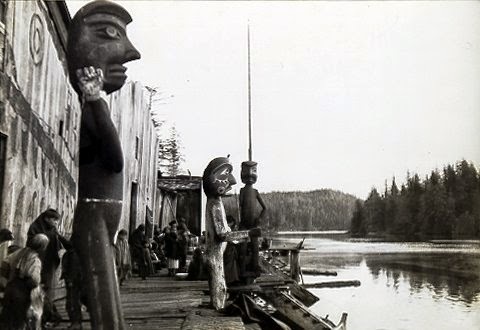 Due to its isolation, the Nakwaxda’xw at were one of the last First Nations on the coast to retain a traditional way of living, and as a result were of great interest to ethnographers, photographers, and film-makers in the late 1800s and early 1900s. In 1914 the McKenna McBride Commission heard testimony from First Nations relating to the allocation of reserve lands. From the ‘Nakwaxda’xw, Chief Pokleetami told the Commission (through interpreter William Brotchie): “… I will now speak of my land which was always owned by my forefathers and now I come into possession of them myself - This is what I want to say - that the Reserves which are measured out for us - I think they are too small - there is hardly room to turn around in them where we get our livelihood.” One of the requests made was that Seymour Narrows be closed off to any white men. The Commissioners refused this request. 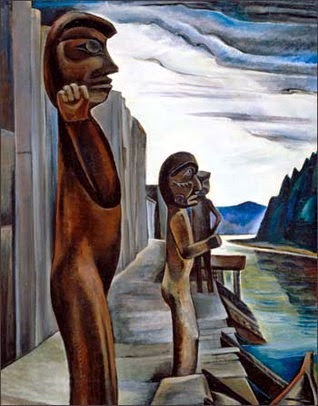 Painting "Blunden Harbour" by Emily Carr. In 1964 the ‘Nakwaxda’xw remaining at Ba’as were pressured into accepting a government relocation to Port Hardy, and much of the remaining village was burned. This short film (22 min) about Blunden Harbour by Robert Gardner (1951) has some great archival film images of the residents of Ba'as collecting and processing traditional foods.